Photonic circuitry is the first-choice technological advancement recognized by the telecommunications industry. Due to the speed, strength, and clarity of signal, photonic circuits are rapidly replacing electronic circuits in a range of applications. 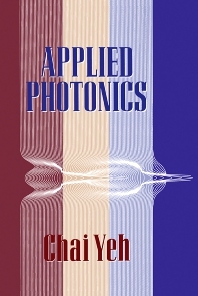 Applied Photonics is a state-of-the-art reference book that describes the fundamental physical concept of photonics and examines the most current information available in the photonics field. Cutting-edge developments in semiconductors, optical switches, and solitons are presented in a readable and easily understandable style, making this volume accessible, if not essential, reading for practicing engineers and scientists. Electronics engineers, telecommunications professionals, colleges, libraries, and research institutes. (Chapter Headings): Introduction. Photons and Interactions. Recent Advances in Semiconductor Laser Technology. Fiber Lasers. Solid-State Lasers. Other Laser Sources. Photonic Detection. Optical Amplifiers. Solitons in Optical Fiber Telecommunications. Phase Conjugators. Photonic Components. Photonic Switches. Photonic Interconnections. Photonic Image Processing. Chapter References. Subject Index.